ChocZero Sinfully Healthy Sugar Free Candy! You are here: Home / Sponsored / ChocZero Sinfully Healthy Sugar Free Candy! ChocZero sent us some extremely YUMMY candy to try out and to tell you about! I can not tell you how good it was! As many of you know, Aarn and I have quit eating sugar and most carbs. While I’ve learned over the years how to make most of my favorite desserts sugar free, (in fact you can find a very helpful ebook with some awesome dessert recipes here) the one thing that has generally been missing from my dessert repertoire is a really good chocolate bar. 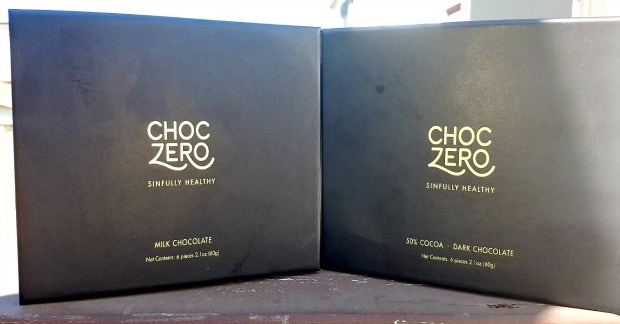 Every sugar free chocolate bar I’ve ever tasted has been chalky or too sickly-sweet with the sugar substitutes but ChocZero manages to get the balance just right. For me personally, I am always looking for the darkest chocolate I can find because of the health benefits of the Cacao bean but the darker you go, typically the more bitter the chocolate becomes and the more sweeteners have to be added to make it balance. ChocZero somehow finds the exact right balance to create a very tasty chocolate even when you go as high as the 70%. It’s nice to be able to find a chocolate that tastes great and doesn’t cause an insulin reaction or weight gain. I can tell you that I very carefully tracked what I was eating on the days I tried this chocolate because I know how what I eat affects my weight and I was looking for evidence that the ChocZero adversely affected my weight. As far as I can tell it had no effect and didn’t cause any rise in my blood sugar or my weight. Couple that with the fact that it tastes great and ChocZero may have gotten a customer for life!